The single most important concept to take from here is that not only is ST not rigid and static...indeed it is more like a fluid made of light, each quanta of which flashes on and off...pulse-propagates into and out of existence...at a frequency (and wavelength) according to its energy...and this fluid light ST unit resonates off a wave of energy at the peak of each pulse-flash...that wave, like a pond ripple, fans out to infinity (or the edge of the Universe...which ever comes first) where it is absorbed back into the sub-Planck event horizon (Singularity) to fuel the next round...communicating...passing on information...as to the location source and energy density...the amount and degree of its presence...its curvature...to every other ST unit throughout the Universe(s), BUT that the ST formation and curvature information propagation is informed, dictated and quantified by the matrix of BBS and the ISL...the bean counters par excellence! And if that is not enough to fully float your boat, toss in the fractal. Yes the Fractal Universe. The whole pulse-propagating, BBS-ISL dependent, boson ST unit...a.k.a. curved ST...is a reiterative, self-similar fractal manifestation of the perfectly recyclable Universe. In the NEW Simplified INTRODUCTION to TPISC (pg 35), you get a greatly simplified introduction and overview of TPISC: The Pythagorean — Inverse Square Connection white paper. The actual white paper (TPISC) is packed full of visual media, charts and tables to follow the process of discovery. 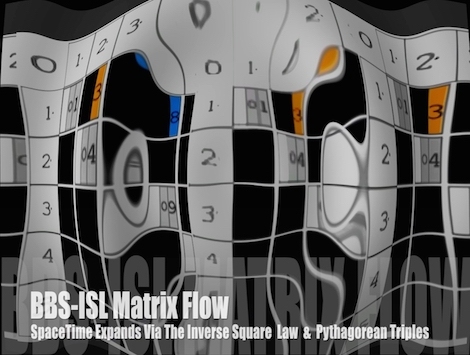 The relationships — connections and inter-connections — between the BBS-ISL Matrix and the Pythagorean Theorem (as Pythagorean Triples) is so vast that the process of simplifying it down to consistent, irrefutable and concrete visuals became the motivation and driving force of this entire project. The ebook is free. What is so amazing about the BBS-ISL Matrix? If you scan each Row/Column, only some have squared numbers. If they do, the squared numbers always come in pair-sets. In every case, those square number pair-sets are the AREAS of the two shorter sides ("a" and "b") of a Pythagorean Triple triangle. The longer hypotenuse (c) AREA is located on the Prime Diagonal — the diagonal line dividing the matrix grid evenly into two symmetrical halves! There is so much more! As are the implications! Fast forward to the flower bud stage. You have already locked in the nutrient-grabbing root structure and its co-dependent energy-gathering leaf structure. But now you must differentiate leaf buds into flower buds. But where, how many and in what order should they evolve? Being that the ISL is built around “squared” numbers— SQUARES—it naturally follows and builds ST with pure, ideal, highly symmetrical circle-sphere and square-cube isosceles right-triangle geometry. Together, these two geometries form TPISC—The Pythagorean-Inverse Square Connection. A connection that can realize everything from the Golden Mean to the Cosmos itself! What is the ISL (Inverse Square Law)? Universal law of Nature that describes how influence (energy, force, light, sound,...) is diluted with distance from the source — as in density ∝ 1/r2. What is the BBS-ISL Matrix? A matrix grid of Natural Whole numbers that describes the ISL. Is the BBS-ISL Matrix a multiplication table? No! Only the Primary/Prime Diagonal (PD), which divides the matrix into two equal, symmetrical triangles like the diagonals on an ordinary square, is composed of the multiplication product (the “squares”) of the two Axis numbers. Why does the BBS-ISL Matrix look so complex? New things often “look” complicated, even when they are extremely simple! How can you let me see that? Easy, can you add 2 to any number? Yes! Then you can easily make the 1st diagonal—1st diagonal running parallel next to the PD. Start with 3 + 2 = 5. OK, that was easy! But where did the 3 come from? PD 4 - PD 1 = 3. Yes, of course! On the 2nd parallel diagonal from the PD, start with 8 and add 4 to each subsequent sum. So let me guess, the next diagonal—the 3rd parallel to the PD will increase by either 6 or 8? The 3rd diagonal, starting with 15, increases by 6. 15 + 6 = 21 21 + 6 = 27 27 + 6 = 33 ... And, the starting number came from the difference (∆) between the PDs—one from above at the top of the column, and one to the right at the end of the row, both where they intersect the PD. PD 16 - PD 1 = 15. TIP: The number (#) we are adding each time to the specific starting number is simply double (2x) the Axis number of that diagonal! Are the rest of the parallel diagonals all formed the same way? Hold on a minute! What about the other half? Remember, it is a symmetrical mirror of the lower half. The rows and columns just point 90° the other way. To keep things simple, we often work with just the lower half. The same numbers fill in the cells of the upper halve. Does the PD play any other roles in the matrix? Yes, absolutely. For one, every grid cell value is simply the ∆ between the PD values at the row and column intercepts. So are there any other things this BBS-ISL Matrix can do? I getting kinda bored, ya know! Yes! Hundreds and hundreds of things. Too many to name here, but there is another very interesting geometry that really sticks out—the Pythagorean Triples (PTs), a.k.a. Pythagorean Triangles. The Pythagorean Triples (PTs) are 90° right-triangles composed solely of Natural Whole numbers—just like in the BBS-ISL Matrix. They come in two forms: primitives (irreducible “parent” forms) and non-primitives (multiples of the primitives, “child” forms). There are an infinite number of both. So what does that have to do with the BBS-ISL Matrix? Every PT resides uniquely on a row upon the matrix, and, the Pythagorean Theorem Proof of any, and all, such PTs is found by sliding the “squares” of the PT’s sides to the origins of the matrix. Does every row have a PT? No. Only those rows with Squared numbers from the PD above. Explain? Take a PD number from anywhere on the PD (9 +). Drop down that column until you intersect with a row cell value that is also a Squared PD number. Next, go along that same row until you reach a 2nd Squared PD number. Those two “squared” cell values = b2 and a2 , and, the c value will be at the end of that row on the PD. That is the c2 = a2 + b2 PT. Squared Pair-Sets. Can the same PT be on different rows? No. It is always unique to a specific row. Can more than one PT be on the same row? Yes, there can be 2, 3, 4, … other sized PTs that occupy the same row—each has its Squared Pair-Sets of b2 and a2 values. Are the PTs connected in any way? Yes, absolutely! Every PT is ultimately connected to every other PT and that Number Sequence Patterning is presented in TPISC I: Basics (free) and TPISC II: Advanced. OK, without my reading a math book—even one only about Natural Whole numbers—why should I care about this? What does a matrix grid-table of the ISL and the ubiquitously embedded PTs have to do with my reality??? The short answer: Everything! The ISL defines the SpaceTime (ST) of the Universe. No exceptions. That ST is in flux—it is dynamically generated and re-generated as to the energy density it is informing—sitting within a larger soup of other STs formed and forming. The information of the influence dilution (energy, force, light, sound, ....) that the ISL conveys is completely known from the onset! The exact same thing occurs for the embedded PTs. They, too, are ubiquitously present and simultaneously known for all sizes of PTs form the smallest 3—4—5 to the infinite largest. Well, you’ve got me there! But, so what? Glad you asked! You see, the basis of the BBS-ISL Matrix is that of the circle/square. Perfectly symmetrical geometric forms containing 90° right-angle isosceles triangles. These inform ST in a manner reflecting these properties. OK. Squares or rectangles, so what’s the big deal? Now you’re talking. Unlike the formation of ST on nothing but simple circle/square geometry, asymmetrical rectangles allow for specific, slightly different geometry to come into play—within the ISL layout—at articulated points of interest—nodes—that give the forming ST new instructions, e.i., at this nodal point of ST formation, your next expansion shall now follow the rectangular geometry of the PT versus the circle/square geometry of the strict ISL. Where do these nodes occur? They occur along those rows that contain a PT. Specifically at the Squared Pair-Set values that defined that PT on a particular row. If you were to venture in to TPISC II: Advanced, you would find that the Extended Dickson Method lays out a complete geometric pattern for each PT, centered around the Squared Pair-Set values. That’s it? We (Nature) can make things out of rectangles in addition to circles, squares and isosceles triangles? Evolution is based on, among other factors, the geometry that informs the structure—animate or inanimate. All rectangles contain perfect circles, squares and isosceles triangles in addition to their own ovals, rectangles and non-isosceles triangles. (Ignoring Platonic Solids for this discussion.) In other words, the asymmetry introduced with the PT geometry brings an evolution of form to a level of greater complexity—more options, more possibilities—that enriches the creative expressive possibilities of a forming ST. Multiply this repeatedly and you end up with a dahlia, a galaxy, a cosmos! Together, the symmetric and asymmetric instructions sets of the ISL and PTs—respectively—give rise to the expression of ST.
Aren’t there other forms—including fractal-like forms, the golden rectangle, etc. that are so obviously in play in the ST forms we see with our eyes (and telescopes) everyday? Indeed, and the PTs are suggested as acting in just such a manner—as fractal-like forms with re-iterative, self-similar pattern-modes of form expression. TPISC reveals exactly how the PTs replicate and are related to each other, and, how they are related back to the ISL via the BBS-ISL Matrix. Their relationship with the Golden Mean/Proportion/ Rectangle is built into the BBS-ISL Matrix itself. How can I use my understanding of TPISC tomorrow when I wake up and start a new day? From your dreams of the impossible, wake up aware that you now have some knowing of just how Nature— Nature in all her profound wisdom—builds the very ST upon which you take your next breath, sip that favored cup of joe, while you peruse the headlines of idiots doing violence to others!